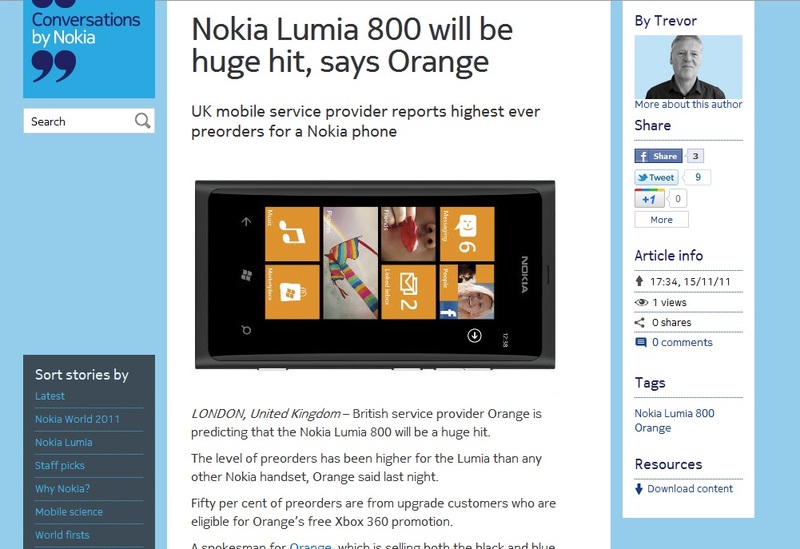 Nokia Conversations published a story saying that according to Orange UK, The Nokia 800 was the highest ever pre-ordered Nokia phone. Sounds good. In keeping with the results heard in ThePhoneHouse, France (ThePhoneHouse btw, the largest mobile retailer in Europe). We should note that this is all relative. Some gritty numbers is what we’d like to hear about too, but still, it bodes well for the success of the Nokia 800. The only thing to gauge on is that the interest is much more than any other handset, more than the ‘huge selling’ N95 and 5800. Something that is odd though – that post on Nokia Conversations has disappeared. As Surur points out, you can see the cached version here. Something extra special on Orange is that there’s a promotion to get a FREE XBox 360 – so you can go make more use of Xbox Live or even pair up with some Kinect games perhaps (though you might have to get kinect). Orange (like ThePhoneHouse) has had a huge response for the 800 BEFORE the marketing has all even started. “As a result of the level of interest we’ve had in preorders, we’re really positive about the launch of the Nokia Lumia 800 which we believe will be really popular with our customers. “This is the largest interest we’ve had in a Nokia handset, including the huge-selling N95 and 5800 handsets, and our marketing campaign hasn’t kicked in yet. But with such good news, why is the Nokia Conversations post not there any more? This time, it’s less on what Orange is saying but what Nokia is saying. Overall (and much better this way) there is a positive response everywhere. Reviewers are finding it to have a great user experience of both hardware and software, but also consumers are aware of the stunning Nokia Lumia and really want it. Ace job on the marketing. I’ve been begging for Nokia to give their phones the push to get the public attention they deserve. It’s a shame it wasn’t done to this level before but it’s better done now rather than never. Cheers @keizka for the tip!